Raised relief globes can be a valuable tool to help your children learn the sometimes difficult and challenging school lessons in geography. As our world becomes increasingly dependent on the Internet, the professional corporate working environment is becoming increasingly more diverse. We are no longer relegated to working with only people who reside in her immediate local communities. The use of world globes can help your children learn the locations of the many different countries around the world at a much faster rate. How do raise relief globes differ? This type of globe differs slightly from a traditional version in that the surface of the globe will have smooth and bumpy surfaces. For example, the Atlantic and Pacific Oceans will be smooth to the touch, depicting the even and flat surface of a body of water. Mountain ranges will jut out slightly, providing a “raised” sensation as your child runs his or her fingers over this area. By combining the added benefits of learning through “touch” and “sight “ to the traditional forms of learning that include memorizing facts, learning about geography is not only more fun for children but significantly more interesting. Studies have proven that raised relief world globes have increased students learning retention in the classroom by alarming percentages. The differences in elevations between different the many areas of the globe help young children to better interpret what the real world is actually like. Generally speaking, raise relief world globes tend to be significantly higher in detail then other types of globe from generations past. All versions are almost always round, spinning on a slanted axis, as opposed to a book Atlas or flat, folded map which only consists of two dimensions. Of course, children tend to find the spinning globe infinitely more interesting and fun. They also allow the child to more easily determine the distances between countries, states, cities, continents, lakes, oceans, mountains, and rivers in relation to where they are currently living today. People learn in different ways, and children are no different. Some people are very gifted memorizing facts and details, while others are more visual and require more “hands on” learning techniques. This is partially why children are being taught computers and the Internet from a very early age, perhaps as early as first or second grade in some cases. Teachers are well aware that children need diversity in learning methods. As long as our computer screens remain flat and two-dimensional, raised relief globes will always be a useful and attractive tool for professional teachers of all grades. Even before children enter into grammar school, they are being taught nursery rhymes that have been recited over and over for centuries. Even our fairy tales very often begin with the phrase, “Long, long ago, in a land far away…”. This can be misleading to a small child. For example, if you happen to live in Northern California and the youngster is learning about the Cold War era between the United States and Russia, they might easily mistake the notion that Russia is clear on the other side of the world rather than in their own backyard. Raised relief world globes are still used today in classrooms across the world, largely for this very reason. Professional grammar school teachers will always attest to the fact that the use of world globes in the classroom is the best method for teaching their young scholars about the reasons for the changes in season. Nearly every globe that is manufactured is designed in such a way that the earth is depicted as tilted on its axis, just as it is in real life. The equator will be clearly shown as well. Teachers can more easily explain that when it is summertime in Omaha, it is actually wintertime in Sydney, Australia. Learning about the changes of season can sometime be very difficult for young minds to grasp without the use of classroom globes. As the child continues through grammar school, into middle school, high school, and college, the classroom globe tends to change slightly, depicting more and more information. Time zones, longitudes, and latitudes are usually shown on these more detailed versions of globes. Examples of why this would be useful include studies of the American Civil War where the Mason-Dixon Line was an integral part of history. Longitude and latitude lines also came into play when the layout of the individual states of America were determined. As we grow into adulthood, many of these early lessons become almost instinctual. We tend to forget how and when we learned them in our formative years. The educational benefit for the use of world globes in the classroom cannot go unnoticed. Continue the education! 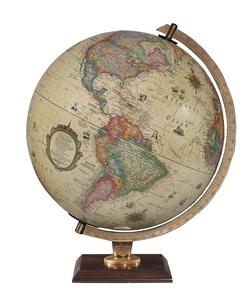 Check out 1,000s of world globes and maps at http://www.ultimateglobes.com!